I have chosen to ask the question what is “12” and what is “7”? I also have the question, what is the ceremony of 12? I found out that the 12 and 7 are the ages of Jonas and Lilly. The point in the book that gives it away is in chapter* when Jonas tells his parents what he had a dream about. Jonas said he had a dream about wanting to take a bath with a girl that he likes, His mom wants him to stay behind to talk as his sister and dad head off to school. His mom said not to worry because it happened to his dad when he was this age and it will happen to Lilly when she grows up too. His mom suggested he start taking medication to help with it. The ceremony of 12 is a big deal, it is when you get your job assignment, The job that you is the one you have for the rest of your life or until you go into the “House Of Old”. When it was Jonas’ turn to go up on stage they skipped him because the had a very big announcement. he was going to be the next receiver of memories. In my last question I asked what is “12” and “7”. In Chapter 5 it says Jonas has a dream about being in a room with bathtubs and some girl i’m guessing he likes, He tells his parents about it and they tell Jonas it is okay. The mother keeps Jonas after Lilly goes to school, She says that his father had the same problem at his age, and Lilly would still go through it. I’m guessing he is 11 turning 12 because there is a ceremony of 12 coming up and he is kinda nervous about it. I think what is happening is that Jonas is growing up and going through puberty. I don’t have a new question or a prediction yet. The characters that have been mentioned in the book are Jonas it says he is an “11” so it means either he is 11 or in grade 11, he has a sister Lilly and it says she is a “7” so again she could be in age 7 or she could be in grade 7. There are two other characters in the book and that is Mother and Father. There isn’t much about Mother and Father yet but what we do know is that the Mother is something like a lawyer and the father is something like a nurturer (works with the newborns) and that’s all we really know about the characters. I don’t have a prediction of what is going to happen in chapter two because we just started the book. Evan and myself are planing a feildtrip to go skiing and snowboarding my main plan was to go tubing but there is only about 6 people who want to go tubing so that inst really going to work. Spring break is coming up and we don’t have enough time to do it before so we are planing to do it after. Have you ever just wanted to sit back in the sun on a nice sunny day, or take a road trip and just follow the signs to nowhere and see where you end up. If you have then you know that you are a person who has adventure and imagination but if all you think about is work and worrying about your life then you have to take a break and stop worrying about what is going to happen tomorrow and just let the paper land where it falls. I use to worry about a lot of things like “how are we going to get here with only that much gas” but then you realize that the world is always going to be there and by not having a bit of gas isn’t going to stop it from going around. I’m not going to lie, I have feelings for inanimate objects and that can effect a person quiet a bit. I would cry over having to get rid of a teddy bear that I won at the fair. Even though it hasn’t changed much I have gotten better and it’s funny to look back on what you did that you thought was a good thing to do. So all as I am trying to say is that you need to relax take a spa day, or if that dosen’t really get your smile on then read a book or do something with a friend. But when tomorrow comes treat it like it is your last day on earth cause you never know when your going to leave. Be Brave and Trust your gut! Yesterday is history, Tomorrow is a mystery, but today is a gift! 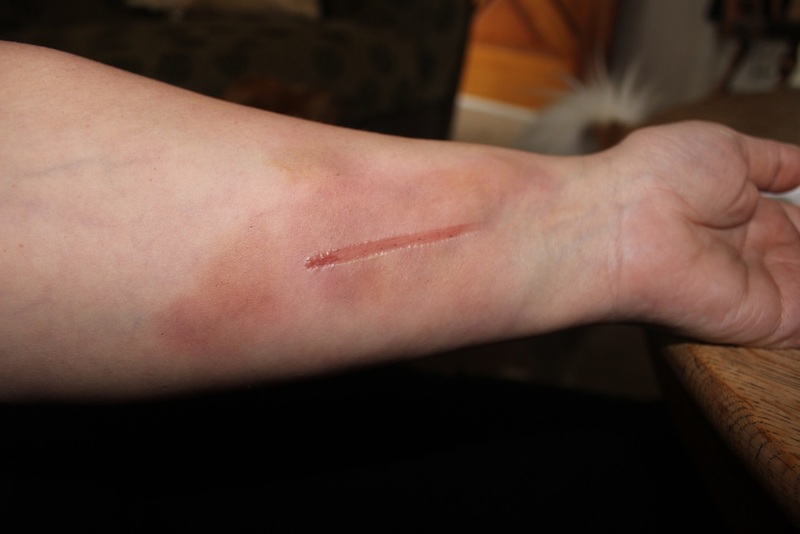 Liquid latex – Liquid latex is a clear or soft white liquid that you apply to the skin to give an effect of a burn, scar, zombie etc..
Scar wax – Scar wax is just like a wax that is tan colour and spreadable. When it is blended into your skin it looks barely noticeable. Rigid Collodion – Rigid Collodion is a strong smelling clear liquid that you apply to dry skin and after layers of the product your skin will start to tighten giving the effect of an aged scar. Ben Nye Colour Pallet – The color pallet consist of 4 colours, dark blue, dark red, dark purple, and green. 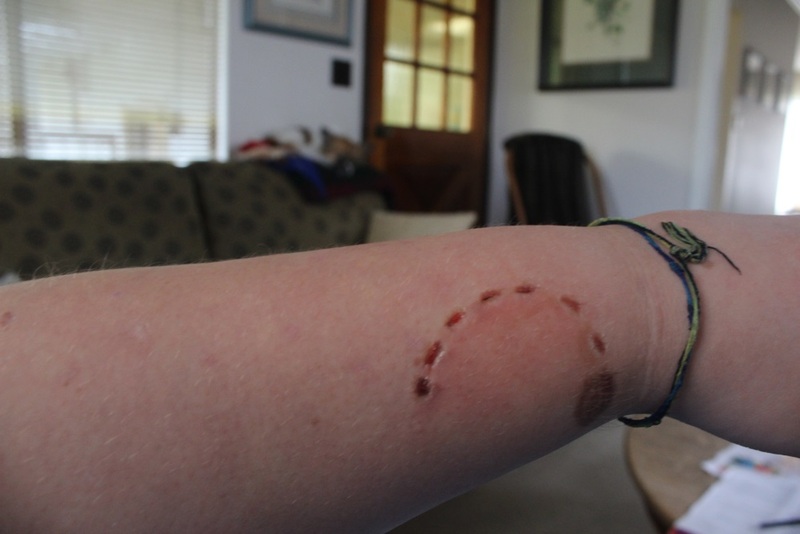 The pallet is used for doing mostly bruises but you can accentuate scars and cuts as well. Blood Gel – Blood gel is exactly what it sounds like, the gel is very think and there for had to apply sometimes. It is a very dark red giving the effect of fresh blood. It takes patience and practice. I’m still not as good as i would like to be but i have improved! Yesterday we had people come in from other schools to have a tour and learn about our school. The tours started around 7:30 and ended around 9:00. I was a tour guide with Aaron and we showed them every room and what we do in them. Feeding the fish was fun because this time the Oscar ate a live goldfish (it was gone by morning) We estimate that there were around 60 students but with parents and younger siblings there were around 100! It was really neat to see a ton of people in your school when normally you only have 35. It was a really long day I got to school at 9:00 in the morning and then left around 9:00 at night so a 12 hour day at school is very very hard! Could I be friends with the protagonist? I think I could be friends with the protagonist because he had a personality of helping people and wanting to have fun. You meet Eddie on his 85th birthday so you don’t know him very well, on his birthday something horrible happens to Eddie. Eddie was doing his walk around to make sure everything was okay and people were not doing anything bad. Eddie was picking up a bottle off the ground when he herd screaming coming from one of the popular rides, he thought nothing of it until he looked up and saw that one of the cables had snapped he tried to get over as fast as he could but poor Eddie couldn’t move fast with his bad hip and his cane. Eddie then saw the young girl sitting under the ride in harms way. Eddie is just a person that wants to help people and make sure everyone is safe and okay and i think i can really relate to him that way and become friends with him based on what Eddie is like and how he acts. Okay so for this new inquiry i am working with Kayla. Me and Kayla like the same stuff so we decided to do a nature, environmentally safe project. Out of garbage and coke cans and other recyclable stuff we are going to make a coquitlam fish other known as “red fish up the river”, we were also going to do a bear and make some moss graffiti. I will give updates and pictures of how we are going along with the project!